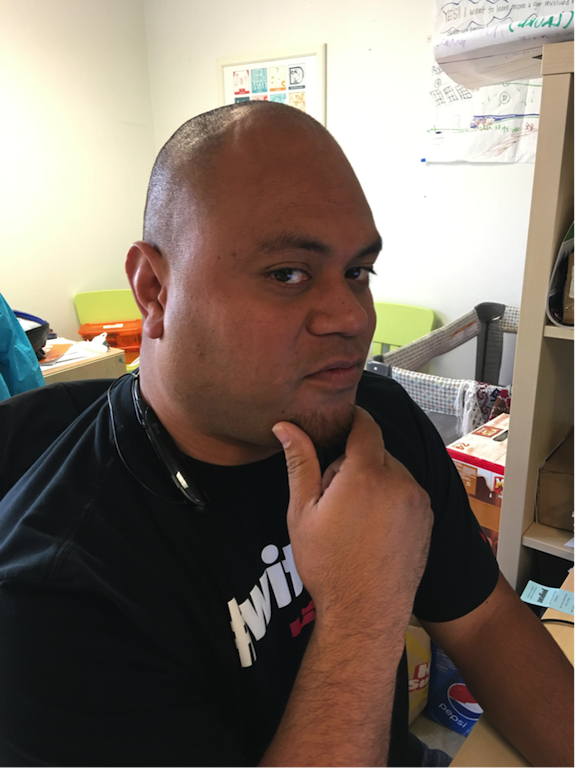 My name is Makerusa Porotesano and I am a Samoan living in Portland, OR. I think it’s important to vote because there is so much power and decision making that everyday people can make with our right to vote. Especially at the local level. Civic engagement means putting yourself in the fight for the civic rights of your communities as a member or ally. Civic engagement is a tool and learned ability that I think we should spread and teach as much as possible. I’m fairly new to Oregon, after being away for six years, so I’m not completely familiar with the issues as I should be, however I tend to trust the voting practices of community organizations that serve those who need our help the most. I think it’s important to vote because it gives you the chance to be a part of the change you want in your community/state. It can help educate you as a voter/community member to understand issues that may be happening in your own backyard that you may not be aware of. It empowers you to have a voice that you may thought had been silenced. 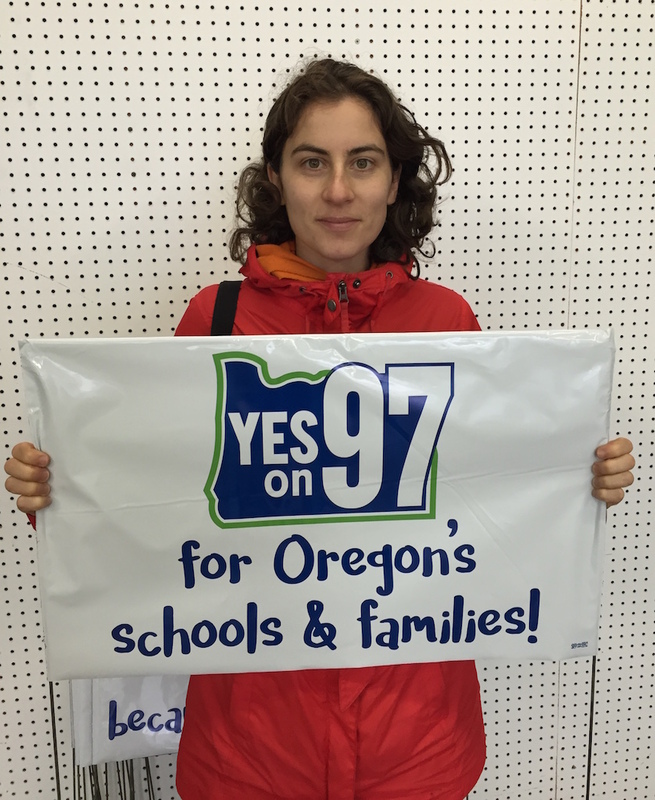 I am voting Yes for Measure 97 because I trust teachers more than out-of-state corporations. Teachers want to increase our state’s graduation rate and give Oregon kids an education we can all be proud of. Big corporations often can only care about maximizing profits. I talked to many people door-to-door that believed the misinformation paid for by these corporations. With out-of-state money poured into the campaign, these companies are banking on Oregon families not checking the facts. I’m voting to close the gap in Oregon’s revenue from corporate taxes because I want to see schools get the funding they need and large companies start paying their fair share. 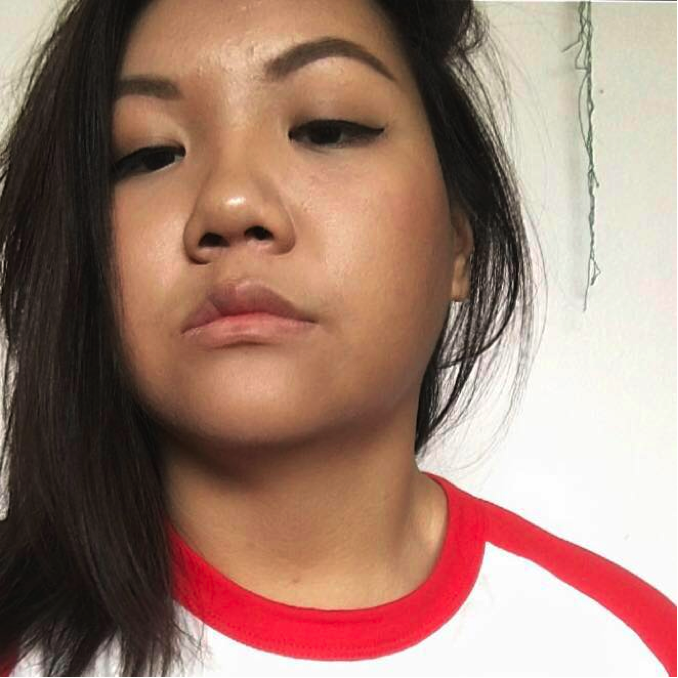 As an Iu-Mienh woman in this country I am voting because I have a right to have a voice. 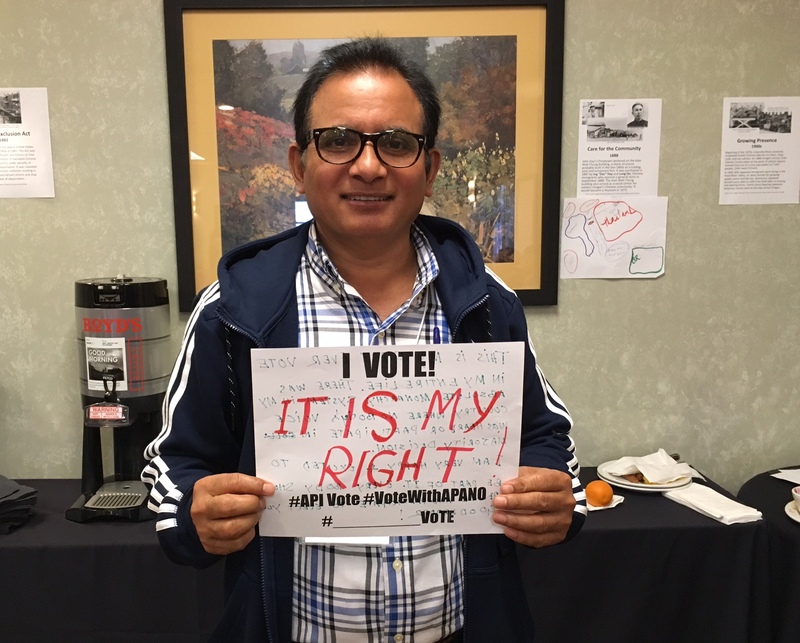 I am voting because I have the right to take part in shaping our community and society that I want to live in. I am voting because I want to to live in a democracy where all genders, sexualities, races, ethnicities, cultures can and are being heard. I’ve seen a trend in my state where education, healthcare for many, and senior services have suffered with inadequate funding at the same time corporations are paying less. They are not paying their fair share to educate the people who work for them. The cost of healthcare for small businesses are going up so high that many can’t afford to cover their employees. The opposition is spending 3 times more money to defeat this measure, and raising all kinds of scare tactics. I don’t believe it. 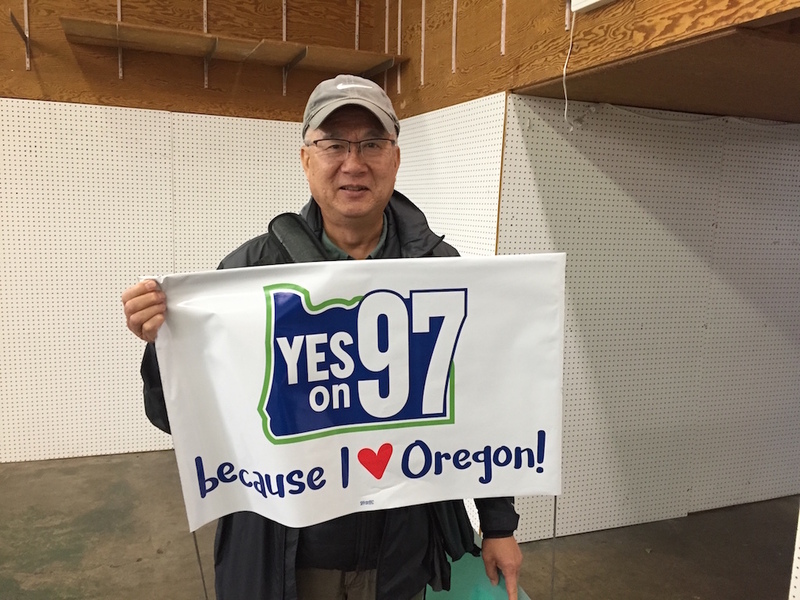 Our state needs Measure 97 and I’m a proud supporter. One of the ways to make a significant change in our community and our society is by engaging in policies, and understanding their impact in our lives. Affordable housing is a big issue to me, as someone born and raised in Portland. Recently as an interpreter I have been exposed to cases in which Vietnamese families are struggling with housing. As a result they have to move out of the neighborhood, worrying about where they will live next and how they will meet basic needs. Growing up in poverty, I also know first hand the affects of having to transition to different living situations because of instability. This interrupts learning and the ability to thrive in a stable environment. I’m a huge advocate of Measure 26-179, “Yes for Affordable Homes” – This is real a solution that Portland needs right now, so I vote as a first step in creating change and I’m encouraging others in my community to vote as well. Voting is important to me because it’s a right that many people in this country risked to fight for, especially for communities of color. As a half Afghan/half Yemeni Muslim American, my very existence is political and at the forefront of discussion. Voting is my way of making my interests known and heard. It’s my way of taking a step to make sure my neighbors and friends are safe, and know that they are being cared for. I vote because it is my right and also my duty. 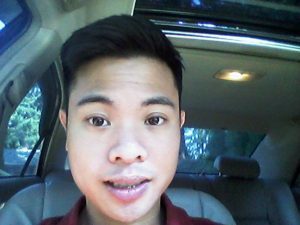 I came to the US many years ago seeking freedom and opportunities to build a better life for my family. I am proud to become an American and proud of my contributions to this country. We must get out to vote and elect leaders who will represent all Americans and can effectively address racial issues happening across the country. We cannot stay at the sideline and wake up the day after the election asking ourselves what just happened. 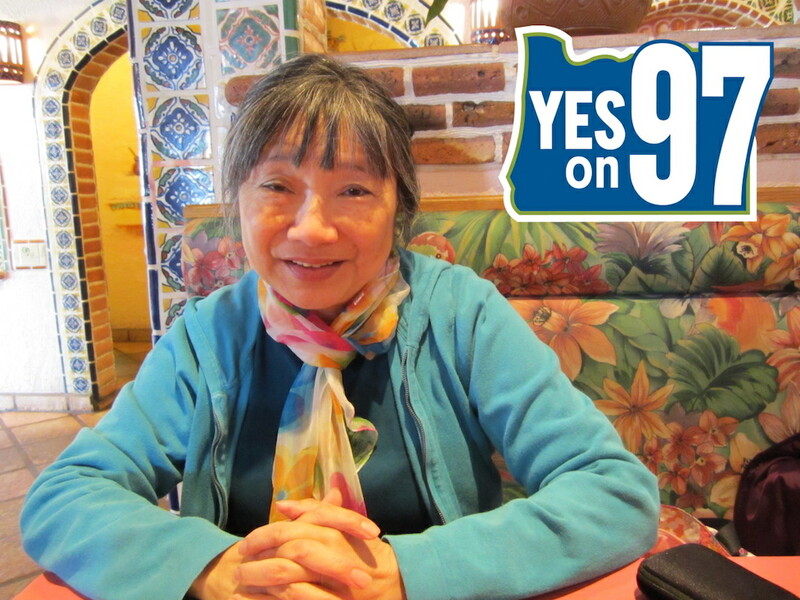 I am also supporting Measure 97 which will be on the ballot this year. We all have a responsibility to care for our society. Measure 97 is a smart and serious investment that will make big improvements now and into the future. I’m voting YES so our grandchildren live in a better Oregon. I’m voting because so many Americans in the past have fought for my right to do so. I can’t take it for granted. I also want to have a say in what goes on in our government, as it directly affects myself, members of my API community, and other community members who desperately need change. Civic engagement allows us to break down language and generational barriers that prevent people from participating.In 2012, I registered my mom to vote for the first time. 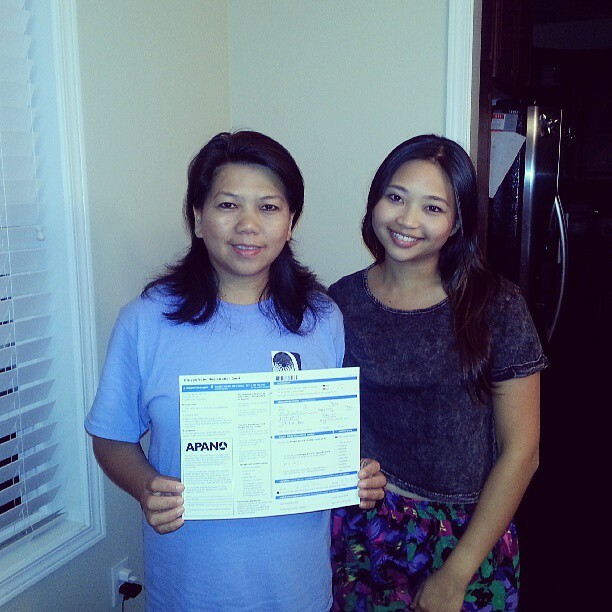 She’s lived in the U.S. for 22 years, has owned her own business, and home, but never got registered. As a daughter of immigrant parents, I had an obligation to teach my family about voting because so many of the decisions being made impact us directly. My parents came to this country for a better future. We can create the future we want by voting for leaders who represent our values and issues that we care about. I vote because I believe in a democracy that represents ALL of the people living here. 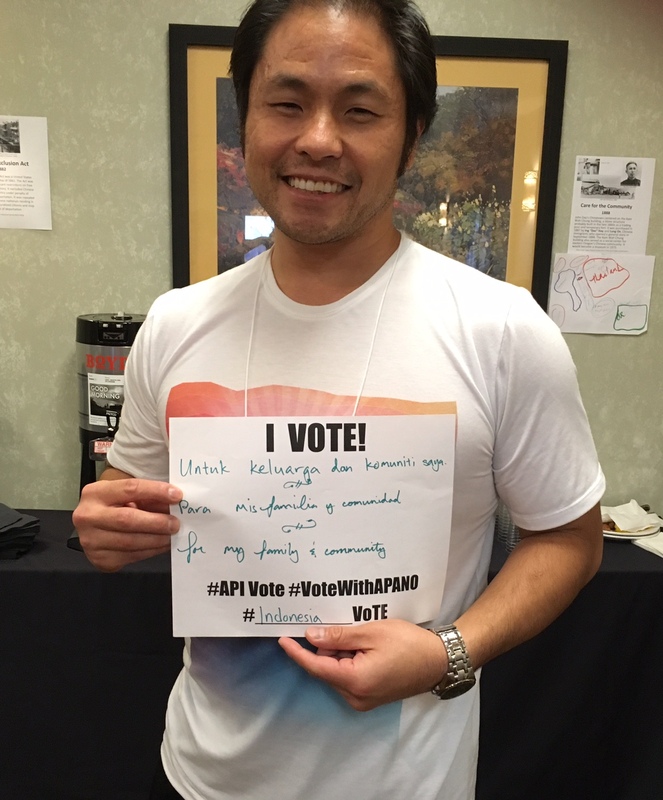 APANO has translated materials and resources about this years election in 5 API languages. 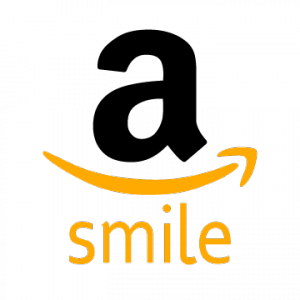 Please check out our website, and consider volunteering with us. I just registered to vote for the first time this weekend! Since I have being involved more with community now I have a better understanding of how important it is to vote. 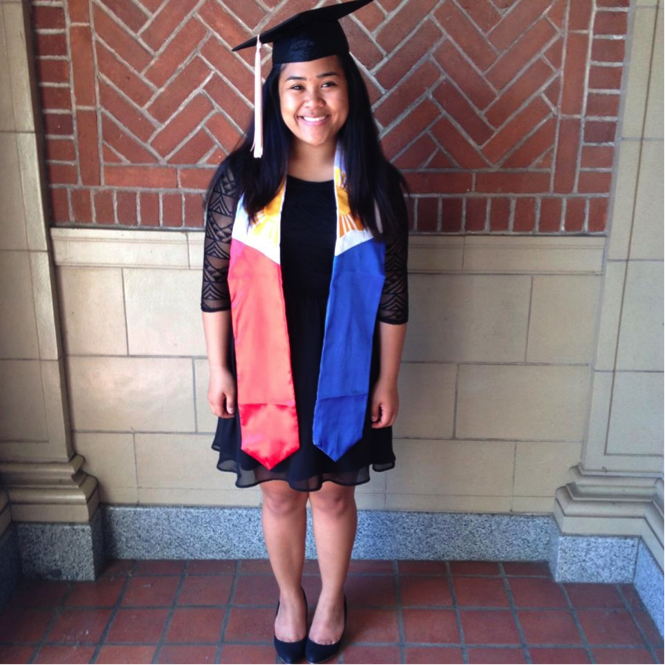 I grew up in east Portland, one of the few Chinese-Hawaiian American families in my school. My parents taught me to believe in the power of voting. 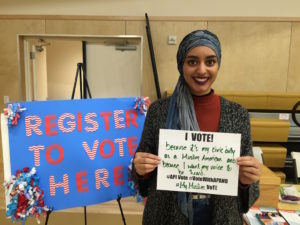 As soon as I turned 18, I registered to vote and have continued our family’s tradition of civic engagement. Voting gives us a voice to support candidates that represent our values and empowers them to advocate for our communities. I’ve spent most of my life in Oregon, raising my two daughters and working in Eugene, Bend and Portland. 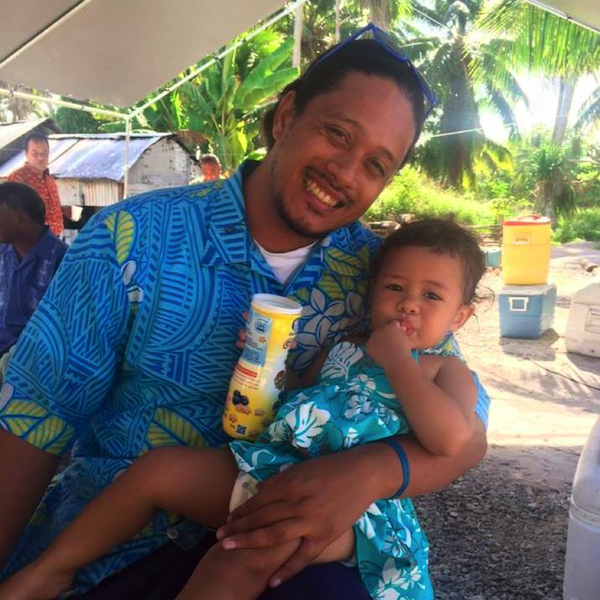 Having built a diverse set of relationships and witnessed the challenges facing our community, I looked around for role models particularly in the Asian and Pacific Islander community for models of elected leadership. Unfortunately, I found very few. 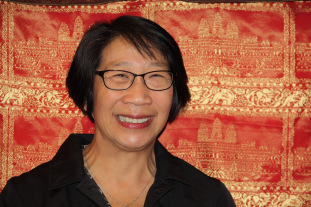 I had become increasingly engaged in civic life, and after graduating from Emerge Oregon, a training program for women interested in elected public service, decided to run for the Portland Community College Board of Directors. secure many endorsements and small contributions, yet more was needed, and unfortunately I did not win in 2015. I know that many in our APANO community are interested in running for public office, yet recognize the power of big money in politics and the value of running on a principled platform accountable to the community. 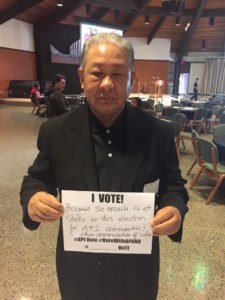 I’m urging you to take two actions in support of democracy reforms: Let Portland City Council know that you support the Open & Accountable Elections Reform, click here to send a message of support to the Mayor and Commissioners. 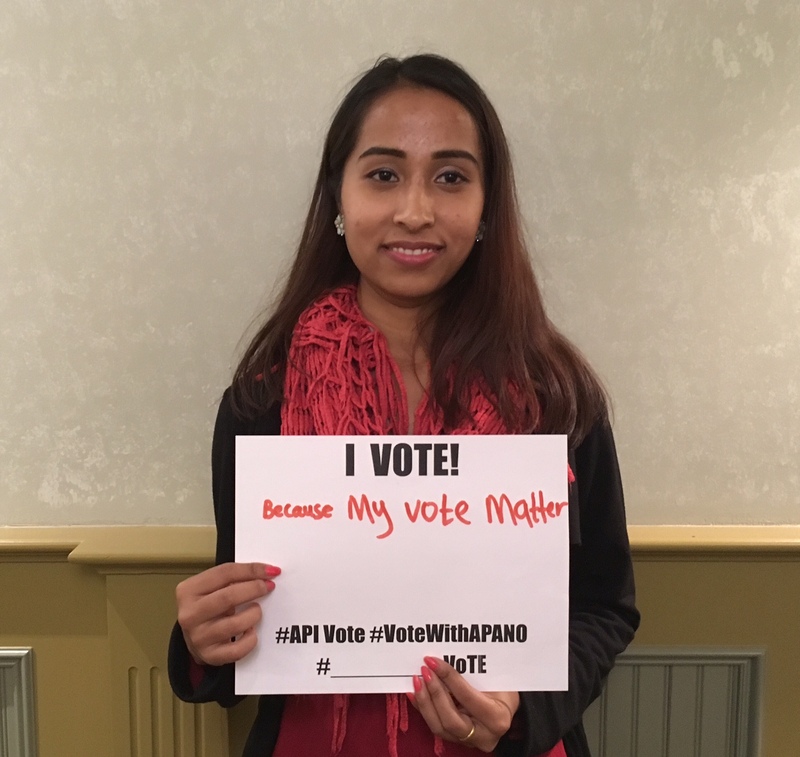 I want to vote because it counts, and it will help communities of color, youth of color, low income communities, indigenous peoples’ communities, and other disadvantaged communities receive the needed resource to grow and to improve livability in their communities. I am a Sansei or third generation Japanese American. My grandparents immigrated to this country in the early part of the 20th century. My family experienced government policies that discriminated against them and incarcerated them because of their heritage. At that time the Issei and Nisei had no political power. The Issei were not allowed to become citizens and most of the Nisei were under 21. One of the great privileges of our democracy is the power of the vote. I want to elect representatives who support my interests. I want to have a voice in how our children are educated, how safe our homes and streets, how we take care of our parents and children and how we pay for the services we want. 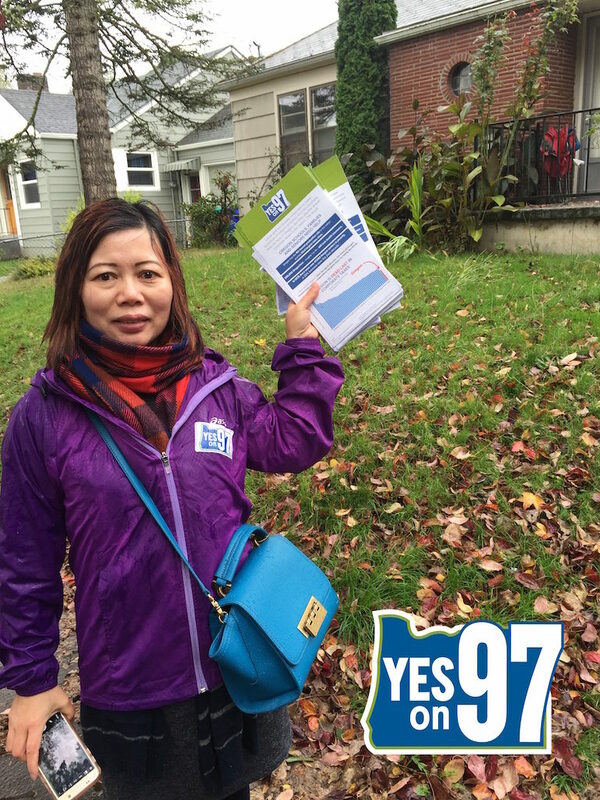 I am supporting Ballot Measure 97 because we need more funding for schools. We want smaller class sizes. We need our children to have music and art taught by music and art teachers. We need librarians in our libraries. We need counselors. Look who is supporting BM 97: social service agencies and human rights organizations. Who are the opponents? Business: Comcast, Wells Fargo, Standard Insurance, Chevron (to name a few). Who wants to have a first class education for our children? I am supporting schools because an education opens the doors to possibility. It means you can move out of poverty. Our free and public education is the foundation of our democracy and we need to support it. I have three children and have lived in Oregon for 20 years. Over the years, I’ve seen our schools struggle to get adequate funding to pay for necessary things, and to support our students. I work a lot and live off a modest wage, and pay 35% of my income to taxes that fund our schools and other services. The big corporations should be held responsible as well, and they need to starting paying taxes to our state. I know many people in my community who will benefit if we pass Measure 97 especially students learning English, the elders who need assistance, and healthcare that is culturally appropriate and meets our needs. I am involved as a volunteer because I like to help others, and this is one way we can make Oregon a better place for our children and families. Everybody can get involved in our efforts. I can use my language skills to provide information to my community. Many families just need to know more about Measure 97. This is how we can make long-lasting change in Oregon. This is my first ever vote in my entire life. There was absolute monarchy system in my country where nobody’s voice was heard and no one could participate in majority of decisions. I am very happy and excited to vote and be part of democracy. Everybody should participate to elect your leaders! I vote to inspire those of my generation to get involved! I believe it is a privilege to be a leader of my community and I will lead by example. 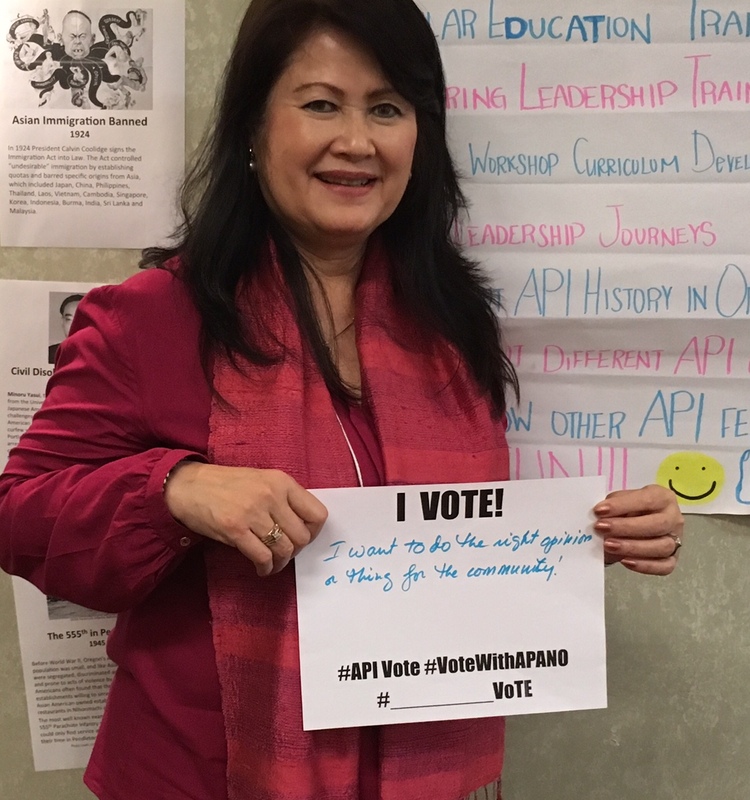 I vote because as a Filipina American, I believe I can influence our political process by supporting the people and policies to make our government better. My voice does matter and I want to see a change in this country. A candidate who does not know their facts or disrespect women physically, emotionally or mentally, is not a good candidate at all. I believe we need to focus on women’s rights, have access to healthcare and end violence against women. This country needs great leaders, especially people of color, who sees the root problems that we face everyday. They also can’t just talk about the issues – they have to do something about them. I have been an activist since coming to US in 2007. Civic engagement for me is the real practice of two of the most important values for me: Giving and Social Justice. 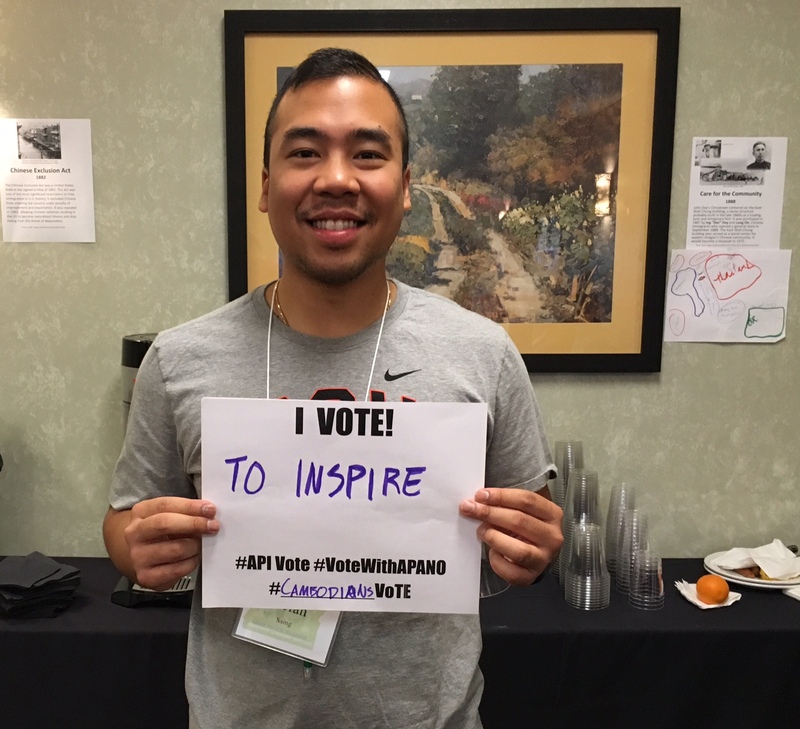 APANO and other Intercultural advocacy organizations can provide a more inclusive role for us in Public policy and civic engagement of our communities of color. 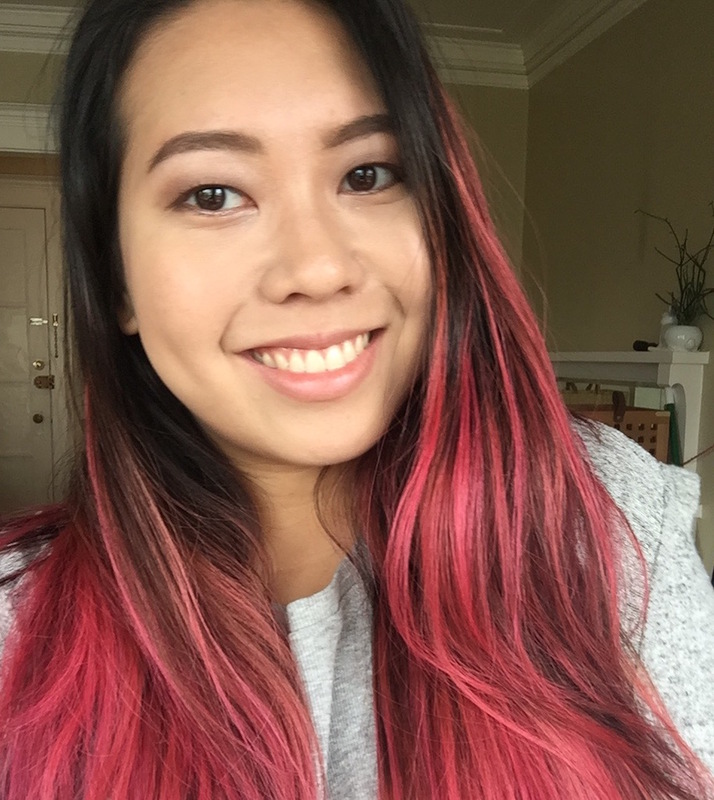 As a West Asian, I find APANO an Inclusive and Multicultural space that allows me to be myself, and practice and fulfill my role and my values. We need to support ourselves by taking action in Civic Engagement, before we ask to be supported by others, so we can work on building our own capacity to include ourselves in decision-making. 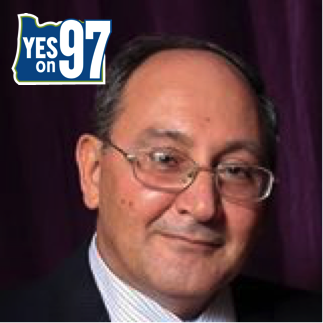 I am voting YES on Measure 97, and I am engaging Refugee communities to encourage our people to participate and Vote Yes on Measure 97. Why? just read what Governor Kate Brown said about this measure and what are the real Dollar numbers behind the role of this measure in financing the deficit in the State Budget that can affect Education, Health and Senior Care services. Our communities are the direct recipients of the funds provided by Measure 97 because we are the under privileged communities that suffer the most. YES, it is time “We the People” get back the Freedom, and live with Justice and Fairness. This is my first time voting in presidential election after I became U.S. citizen. I feel that my vote matters and decisions that are voted on this election.